Until the nation went to war in December 1941 the military preparations for guarding the continental United States centered around four lines of activity: harbor defense, defense against air attack, civilian defense, and the protection of vital nonmilitary installations. 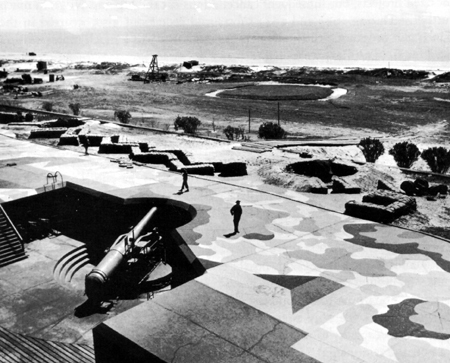 Although primarily concerned with measures for protection against bombardment from the air, the Army did not entirely neglect the fixed coastal defenses that offered limited protection against surface attack. Seacoast defense against a determined surface attack or invasion would have required the integrated employment of all types of Army mobile ground and air forces in addition to the harbor defense units, but plans for employing mobile forces for this purpose remained comparatively nebulous until after the United States entered the war. Prewar plans for an integrated employment of the major air defense elements-aviation, antiaircraft artillery, and an aircraft warning service-were far more concrete, though actual preparations on the eve of Pearl Harbor left much to be desired. Civilian defense, associated with air defense but not considered a direct Army responsibility, received a good deal of military attention during the prewar period that helped to limit military commitments thereafter. On the other hand, the Army had to do much more when war came than it had planned to do in safeguarding nonmilitary installations. The planning, construction, and emplacement of seacoast guns and their auxiliary equipment took a long time under the best of circumstances. This was particularly true of the big guns. From the beginning the 1940 modernization program had to compete with the general and rapid expansion of the whole Army, and the program was also slowed by the continuously expanding naval construction program. By July 1941 only four 16-inch gun batteries were ready for action, and construction work had been started on only five others. By then it appeared that the 16-inch gun program could not possibly be completed for several years and that in the meantime the planned expansion of American air and sea power would make the full program unnecessary. After rearguing the merits of airplanes versus guns in seacoast defense, the War Department in the late summer of 1941 decided to limit active work to those batteries that could be completed by 30 June 1944. As a result all work on fourteen of the thirty-seven 16-inch batteries planned for the continental United States was indefinitely deferred. 11 The expansion of overseas base activity during 1941 was an important factor in delaying the continental 6-inch gun program, the War Department in November giving priority to the completion of twenty 6-inch gun batteries in outlying bases. 12 In consequence, the condition of the continental fixed harbor defenses on the eve of Pearl Harbor was not much different from what it had been before the adoption of the modernization program fifteen months earlier. between higher command headquarters and all subordinate elements of a harbor defense. It was generally believed during the war that these posts permitted a close interservice co-operation that gave the whole harbor defense system a high degree of potential efficiency, but the enemy's failure really to challenge the system leaves this a matter for conjecture. SIX-INCH GUN EMPLACEMENT ON JASPER PARAPET, Charleston, S.C.
thorized projects, but subsequent cancellations cut the big-gun program much further.27 During 1943 and 1944 substantial reductions also occurred in the 6-inch gun program, principally because the Army had a much more pressing need for field artillery weapons. When the war ended the future of coast artillery was still uncertain. The Joint Chiefs of Staff had decided in early 1945, "As to major caliber and minor caliber fixed seacoast artillery, all that we now have, emplaced in continental and overseas harbor defenses, should be retained and maintained in serviceable condition, with the recognition that subsequent developments may demonstrate the desirability of substituting some type of new weapon there for." 28 "Current OPD thought" in October 1945 held that, until new weapons capable of performing Coast Artillery missions were developed, existing installations ought to be maintained in the best possible condition and provided with modern fire control instruments. Between 1940 and 1945 the modernization program had cost more than $220,000,000, and it had provided the continental United States with nearly two hundred modern and modernized guns-including nineteen 16-inch and forty-eight 6-inch long-range batteries. 29 Though the total number of gun installations had declined by more than one half since May 1940, the later equipment was far superior to the earlier in its capacity to resist attack by large ships. In 1945 no attack of this sort on the continental United States could be foreseen for many years to come, and when the war ended all seacoast artillery except a few 90-mm. antiaircraft guns was placed in a strictly caretaking status. In a reassessment of the air defense situation after the outbreak of war in Europe, a new Air Defense Board decided that the continental United States needed only 68 medium bombers and 270 pursuit planes specifically for defense purposes. This estimate was reaffirmed in May 1940, on the eve of Germany's onslaught against the West, because it was believed that a force of this strength could deal adequately with a two-carrier attack on either coast.34 The German triumph in France produced a quick upward revision of the Army's over-all aviation goal, but no provision was made during the summer of 1940 or in the succeeding months of mobilization for allotting more planes to continental defense. Indeed, in the build-up of air power under the new 54-group program, planes were allotted among the wings and, in 1941, among the air forces in the continental United States without any particular reference to continental defense. The exploration of antiaircraft needs in the spring and summer of 1939 set the pattern for Army thinking and planning on the subject until the summer of 1942. The chief problem was to get the men and equipment needed. When the war began in Europe there were only 5 Regular Army and 13 National Guard mobile antiaircraft regiments in existence. The Army organized 4 new Regular Army regiments in the fall of 1939, and it planned to increase the regimental strength of the National Guard from 13 to 28. This expansion, if carried through, would provide 37 regiments instead of the 34 for which equipment was to have been procured under the 1937 plan. The 37 regiments would have to serve all purposes-reinforcement of overseas garrisons, field force duty, and continental coastal defense. Immediately after the attack on Pearl Harbor, the Army deployed about two-thirds of its antiaircraft units and almost all of the antiaircraft weapons available to guard vital installations on the east and west coasts. In units this deployment amounted initially to about 29 regiments. From December 1941 until January 1944 the number of regiments engaged in continental defense remained approximately the same, the total varying between a strength of 24 and 32 regiments 44 Though the number of regiments deployed appeared to represent a rather exact fulfillment of prewar plans, in fact this probably happened more by chance (what chanced to be available in December 1941) than by design. by the end of 1942.45 The Eastern Theater of Operations in February submitted an elaborate antiaircraft artillery defense plan that called for a minimum of about 100 regiments and a maximum of nearly 300 for the defense of the east coast area alone-and the maximum would have required a troop strength of about 458,000.46 A study of the first priority provisions of this plan, together with a re-examination of the August 1939 plan, led the War Department to approve a plan for providing the coastal areas with the equivalent of zoo ;antiaircraft regiments by the end of 1943, and the continental defense commanders were so notified in May 1942.47 The new War Department plan, like that of 1939, allotted more than two-thirds of the projected antiaircraft strength to the east coast. But all of these 1942 projects remained paper plans never to be carried out during World War II. In fact, throughout 1942 and 1943 the west coast had greater antiaircraft artillery strength than the east coast; and in general the continental defense commanders had to get along with the unit strength allotted to them when the United States entered the war. The Signal Corps' SCR-270 radar (and its fixed version, the SCR-271) had a range, when competently operated, of between 100 and 150 miles. When production of the SCR-270 was just beginning in early 1941, the Chief of the Air Corps described this set as "no good" and asked that it be replaced by British radar models as soon as possible.50 After the United States entered the war there was much more widespread criticism of the SCR-270 and continued demands that it be replaced by British equipment. Actually, most of the criticism seems to have been misdirected; the lack of trained manpower to operate the machines, rather than the machines themselves, appears to have been chiefly at fault.51 In any event the SCR-270 was the radar that served the Atlantic and Pacific coasts during 1942 and 1943, the years of active continental defense. the war- The Air Corps began work on a barrage balloon in 1938, but more active preparations did not get under way until the beginning of 1941, after reports during the summer and fall of 1940 had indicated the effectiveness of balloons in Great Britain and Germany in interfering with low-level bombardment. After the Air Corps had developed a large and relatively high-altitude-type balloon, the Chief of Staff decided to transfer most barrage balloon activity to the Coast Artillery Corps. When the Coast Artillery took over at the beginning of June 1941, the Army had three barrage balloon companies and just three balloons. But it had tentatively decided to acquire 3,000 more balloons, and plans evolved during the summer and fall of 1941 to expand the barrage balloon force to be used for continental defense purposes alone to eighty-five batteries, each flying thirty-five balloons.54 By 1 November 1941, five battalions of three batteries each were being organized and trained at the Barrage Balloon Training Center at Camp Davis, North Carolina. The Army sent three of these battalions to bolster the air defenses of the west coast soon after the outbreak of war. It also decided to replace the Air Corps type of balloon with the smaller British balloon which, although designed to fly at lower levels, was easier to handle, less expensive to manufacture and operate, and readily procurable. coastal radar stations and from a civilian ground observer's organization through intermediate filter centers. The information center in turn would alert all air defense elements and issue air raid warnings to the civilian defense organization. In the fall of 1941 the Army Air Forces assumed that it would command the whole air defense system in the continental United States in time of war, by exercising operational control over the ground elements of the system. come involved in too much expense and too many requests for immediate assistance.64 It also shied away from a separate civilian defense bureau, agreeing instead that civilian defense preparations could be combined with internal security functions in the Provost Marshal General's office provided for in current mobilization plans. (1) Exercise general supervision of civil defense planning. (2) Provide for administrative control of civil defense by appropriate War Department and civil agencies. (3) Co-ordinate civil defense measures with other War Department activities. (4) Authorize the use of military personnel to assist local, municipal, and state authorities. defense where there is an overlap, and to render such assistance as may be feasible and mutually agreeable. (b) Operation of all armed forces in combating enemy forces. (d) Enforcement, in conjunction with the civil authorities, of radio silences, blackouts, and other necessary protective measures in connection with active military defense. and state organizations operating under state police powers. But to secure uniformity in practice and effective mutual aid across state boundaries in a serious emergency this local foundation and organization needed much firmer guidance than it had during World War II from either the Army or the Office of Civilian Defense. security missions, the aim of the plan was Army co-operation through the corps area commanders with state and local guards and police forces in order to avoid the use of Army forces in an emergency. The corps area commanders were instructed on 1 November 1940 to gather information as discreetly as possible about state and local plans for dealing with fifth columnists and to transmit it to the War Department.90 By August 1941, all of the corps areas had completed local counter-fifth column plans, and the War Department arranged for a peacetime test of the First Corps Area (New England) plan in October 1941. In the same month, the War Department transferred the responsibility for supervising this work from G-2 to the Office of the Provost Marshal General, which had been activated on 31 July.91 But, when large numbers of Army combat troops were assigned by the corps area commanders to guard duty immediately after Pearl Harbor, they acted generally under the WHITE plans rather than under the counter-fifth column plans. erally younger and more impulsive than is desirable for men on such special duty. It is possible that a service of civilian guards may become necessary for plant protection, but I am sure that military units should be kept as an emergency reserve under the Corps Area commanders. We are planning to increase our Military Police force for this particular purpose.